Beef O’Brady’s Bowl: Will East Carolina show up? 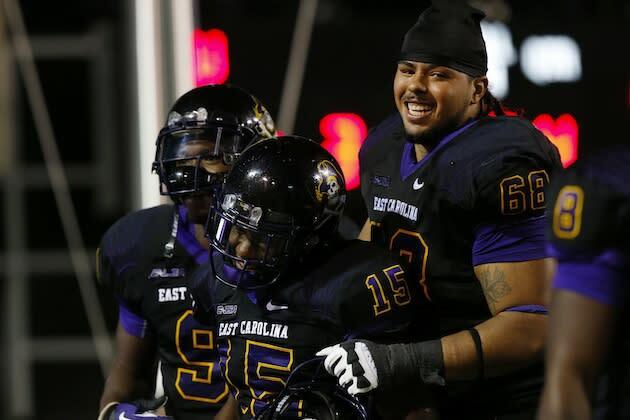 Entering its season finale against Marshall, East Carolina had won five straight. Six straight meant a Conference USA Championship Game berth and a win there meant a trip to the Liberty Bowl. East Carolina was promptly manhandled by the Thundering Herd 59-28. There's nothing to play for against Ohio in the Beef O'Brady's Bowl. Well, unless you think a Beef O'Brady's Bowl win is something to play for. Will the good East Carolina show up? It's a game of strength vs. strength. East Carolina's passing attack is ranked 11th in the country at 331 yards per game. Ohio has given up 212 passing yards per game. The Bobcats are much worse against the run, but East Carolina runs the ball poorly. The Pirates are 101st in the nation in rushing offense. That's because quarterback Shane Carden and receiver Justin Hardy have been incredible. Carden has thrown for 3.866 yards and 32 touchdowns while Hardy has 105 catches and 1,218 and eight touchdowns. If the good East Carolina shows up, Ohio may have a hard time keeping up. The Bobcats average 28 points per game. ECU averages 40, and in that aforementioned five game win streak, scored more than 50 points three times. A bobcat may be more naturally vicious than a pirate, but a pirate has a sword. A bobcat does not have a sword, unless there's something hidden about Ohio-bred bobcats that we don't know about it. While the bobcat's chances in a sneak attack are pretty good, a duel between the two leans heavily to the pirate. Graham: East Carolina 48, Ohio 14. Not sure what happened to Ohio the last half of the season, but they have been pretty terrible. East Carolina has been on a roll - sans losing to Marshall in the regular season finale - and its high-powered offense should have it's way with the Bobcats. Nick: East Carolina 44, Ohio 24. I said this game was strength vs. strength, but I like ECU's strength much more than I like Ohio's strength. However, I fear that the Pirates could be seismically attracted to Raymond James Stadium and the pirate ship that resides there, forgetting the game is at Tropicana Field and having to forfeit the game. Sam: East Carolina 37, Ohio 24. Ohio fell apart at the end of the year, losing games to Buffalo, Bowling Green and Kent State by a combined 107 points and ECU ended the year with a rough loss to Marshall. Both teams are looking to bounce back, but the Carden to Hardy connection for ECU will be too tough for the Bobcats to handle.